Congratulations are due to Green MP Caroline Lucas, who walked free from court today after criminal charges against her were overturned. She had been charged with obstructing a public highway and a public order offence, during high-profile anti-fracking protests last summer. Neither offence carries a prison sentence – the maximum penalty for either charge would have been a fine of up to £1,000. District judge Tim Pattinson said the prosecution had failed to satisfy him that Lucas had “the requisite knowledge” about the Section 14 order being in place. On the obstruction charge, he said he did not hear any evidence that any actual obstruction of a vehicle or person was caused by the protest. 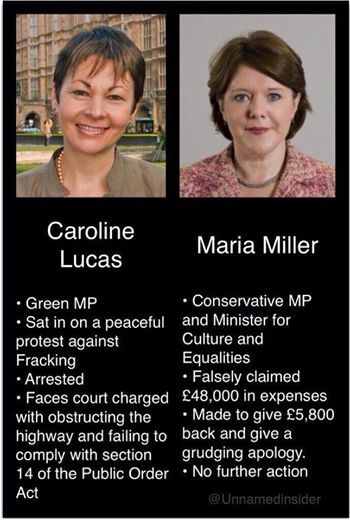 It is good for British justice that Ms Lucas was acquitted – but bad for British justice that she was taken to court in the first place, most particularly because the case contrasts so strongly with that of disgraced former cabinet minister Maria Miller. 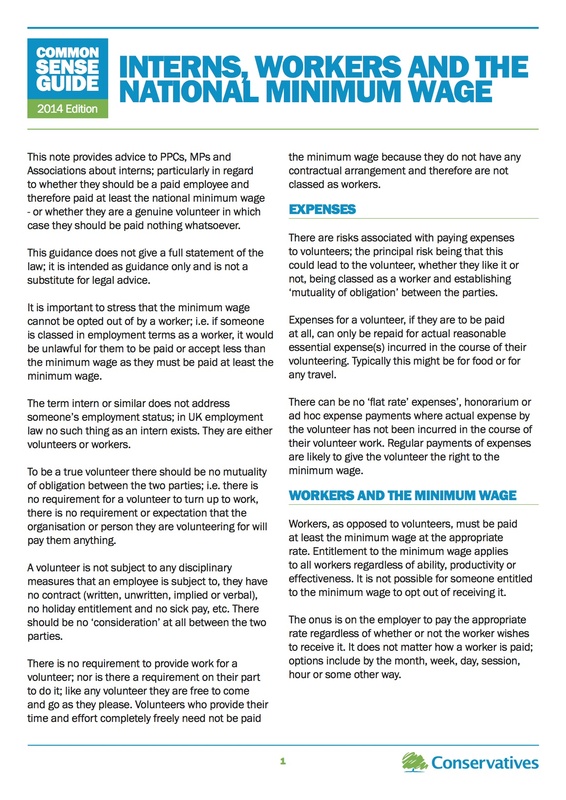 Miller claimed tens of thousands of pounds of taxpayers’ money under false pretences. You can call that fraud, if you like (maximum penalty: 10 years’ imprisonment). Did she go to court? No. Because she is a member of Parliament, the financial irregularity was investigated by a Parliamentary body, the Commons Committee on Standards. Rather than take the advice of the Parliamentary Standards Commissioner, who recommended that Miller pay back the full amount, the committee ruled that she should return just £5,800 and apologise to Parliament for obstructive behaviour during the investigation. Surely everybody can see the double-standard here? The least we can learn from these two stories is that the law absolutely does not treat everybody equally. Ms Lucas was arrested, detained at Her Majesty’s convenience and now she has faced trial for the offences alleged against her. This MP, who opposes the government in Parliament, was then acquitted after a fair trial and has the support of the general public in this matter. Miller was accused of a far more serious crime than Ms Lucas but has not been arrested, has not been detained, and has not been tried for the offences alleged against her. The then-government minister was whitewashed by her colleagues and only resigned because of a public outcry against the decision. What conclusion can the public draw, other than that government MPs are effectively above the law? David Cameron’s government can only redeem itself with two actions: It must remove Parliament’s right to investigate claims of financial irregularity by MPs and placing this duty firmly where it belongs – with the police and the Crown Prosecution Service. 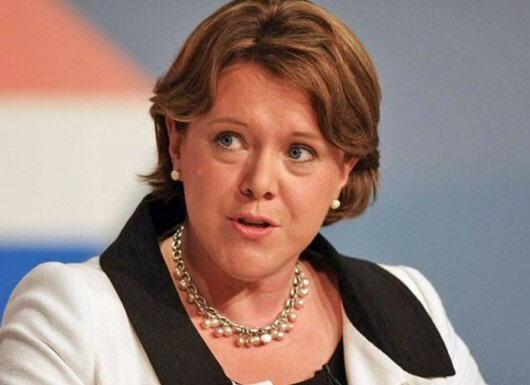 Maria Miller must face a criminal trial, charged with fraud. 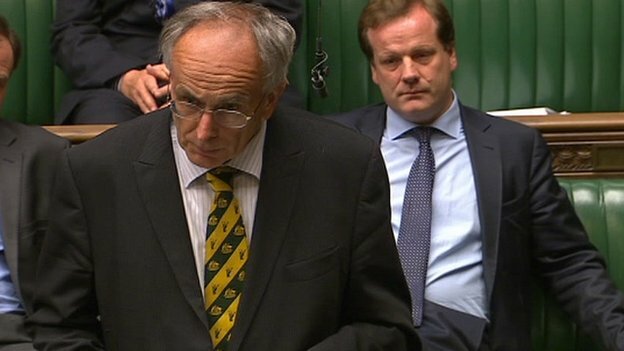 Tory right-whinger Peter Bone is the latest MP to face questions over his expenses. The inquiry will focus on expenses relating to the upkeep of his second home between 2005 and 2009. As such, the investigation will be carried out using the system that was in place before it was reformed after a string of scandals in 2009. Both George Osborne and Maria Miller had their expenses examined under this system, so we can expect Bone to get away with any wrongdoing as well. From evidence that has emerged in the Osborne and Miller investigations, it is clear that the pre-2009 investigation system was completely useless except as a way of whitewashing MPs’ reputations. Of course, Bone is a frequent contributor to Prime Minister’s Questions, where he often claims to have been prompted into making a query by his wife. In the unlikely event that he is found guilty of a misdemeanour, will he be blaming that on Mrs Bone as well? … we need YOUR help to do so. 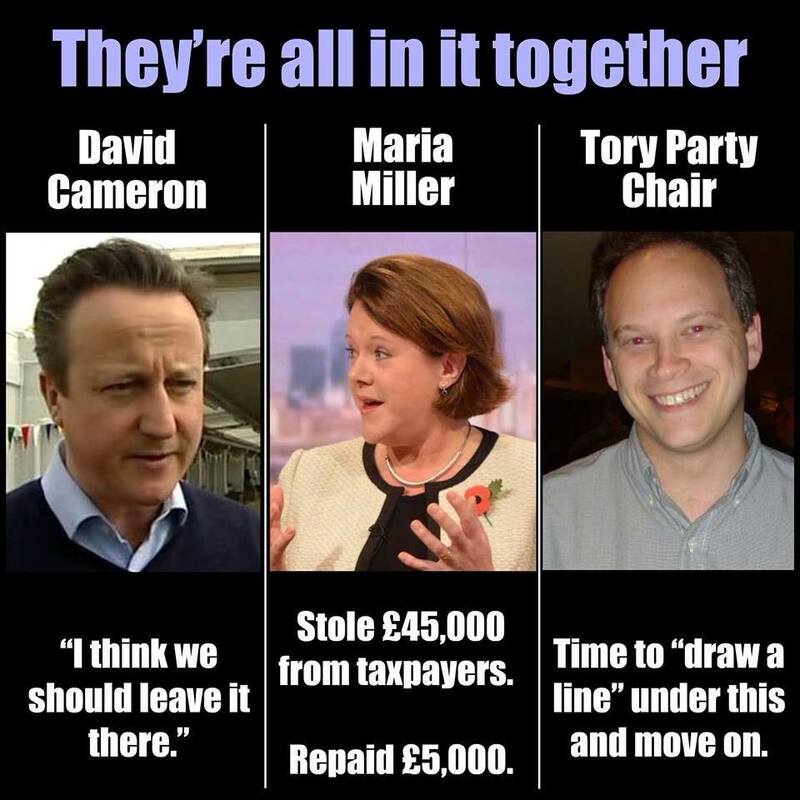 Going (unpunished): Maria Miller has made a huge profit from her misuse of taxpayers’ money while in public office. Now is the time for her to face a criminal investigation. Maria Miller resigned as Culture Secretary today (Wednesday) – after nearly a week of hanging on by her fingernails in the hope that everyone would suddenly forget that she fraudulently claimed mortgage interest on a south London house that she wanted the authorities to believe was her second home (when in fact it was her parents’ first). During that time she has managed to reignite public disgust at the many expenses scandals in which Parliamentarians have been revealed to have been involved since the Daily Telegraph first lifted the lid on them in 2009. She has also managed to undermine public support for comedy Prime Minister David Cameron, whose continuing support for her has shown just how weak he must be. He needed Miller because she was a woman in a predominantly male Cabinet, state-educated in a mainly private-school Cabinet, and an avid supporter of Cameron himself in a government that is beginning to realise that he’s a dud. In supporting her, he showed just how precarious his hold on the leadership really is. Of course, she also generated a huge amount of hatred towards herself. Remember, this is a person who used taxpayers’ money to pay for her parents’ house – a building which she subsequently sold for a profit of more than £1 million. Miller is not the first Cabinet member to make a million with taxpayers’ cash either – stand up George Osborne, who formerly had us paying for a paddock, a house and other scraps of land in his Tatton constituency on which he falsely claimed expenses, saying they were vital for the performance of his duties as an MP. He later sold the lot for around £1 million, having spent not a single penny of his own on the property – it all came from the taxpayer. Osborne was protected from prosecution by the Parliamentary Standards Authority – a body that appears not to be as independent as it claims. Now is the time to report Miller to the police. A Parliamentary inquiry is not the same as a criminal investigation and it is important for her case to be tested in a court of law. This woman was part of a government that has had no qualms about using the law to take taxpayers’ money away from people who needed state benefits in order to survive; now let us see how she fares when the law turns its attention to her. According to the BBC, Maria Miller reckons she is “‘devastated’ that she has let her constituents down”. Is that why her apology to Parliament – which was for behaving badly towards the inquiry into her fraudulent expenses claims, not for making the claims themselves – was so short and contemptuous? She trying to cope with the shame of letting everybody down? Miller should try to bear in mind that we weren’t all born yesterday and most of us have a decent IQ; we don’t have time for these flimsy efforts at self-justification. Let’s remember as well that this is a woman who, as minister for the disabled, co-presided over a benefit assessment system that has led to thousands upon thousands of deaths: the hated Work Capability Assessment. Shall we list the devastation caused by that little policy? Well, too bad. We can’t because the government is too lily-livered and cowardly to release the figures. There is no more obvious way of telling the public that these people are trying to hide serious – by which I mean grave – crimes. So Miller can take her talk of “devastation” and blow it out her ear. The BBC report adds that David Cameron, Britain’s weakest Prime Minister, has continued to support his culture secretary. Cynics have said this is because she is both female and state-educated, and he needs examples of both in his primarily male, privately-educated and extremely, obscenely rich, Cabinet. It has also been suggested that she is extremely loyal to Cameron and, for a weak leader, this must be handy too. The Beeb also says former Commons Speaker Baroness Boothroyd has claimed Miller should resign as a matter of “honour”. Fat chance. There’s no honour amongst thieves. Found on Facebook: Members of the public on all the main social media are queueing up to take a pop at former DWP minister and benefit fraudster Maria Miller. How long will David Cameron delay sacking her, and how weak will he seem by the time he gets round to it? In comparison to recent events in this saga, what follows is light relief. The three tweets appeared on the Department for Culture, Media and Sport’s feed, where they were picked up and shared widely before government watchdogs had a chance to hush them up. The offending tweets have since been deleted from the DCMS feed. “Seriously though guys which one of us hasn’t embezzled and cheated the taxpayer? #FreeMariaMiller,” ran the first tweet. This was swiftly followed by one that claimed Miller, who falsely claimed more than £40,000 in mortgage interest payment for a south London house, saying it was her second home while her parents used it as their first, was “like a modern day Robin Hood, she robs the poor to help the rich”. Unfortunately it seems that the Conservative Party has rallied around the (confirmed) criminal in its ranks and has no intention of allowing British justice anywhere near Miller. They’re all in it together, you see. 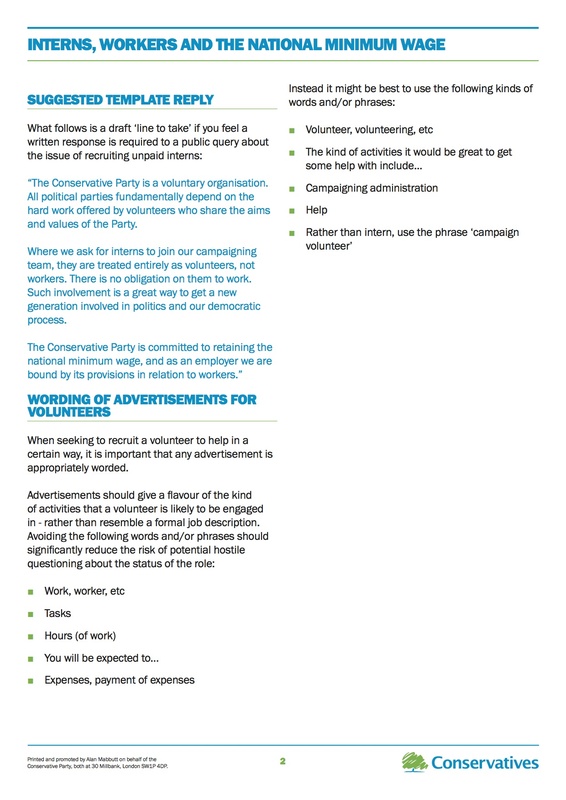 That is why Grant Shapps, who knows a thing or three about false claims himself (ask him about his other persona, ‘Michael Green’) wants to “draw a line” under the affair – and why our pitifully weak comedy Prime Minister David Cameron wants to “leave it there”. A Parliamentary investigation cleared Miller of using public money to provide for her parents, in spite of all the evidence that this was precisely what she had been doing, including a recent revelation that the size of energy bills for the house indicated that somebody had been using it as their main, rather than second, home. 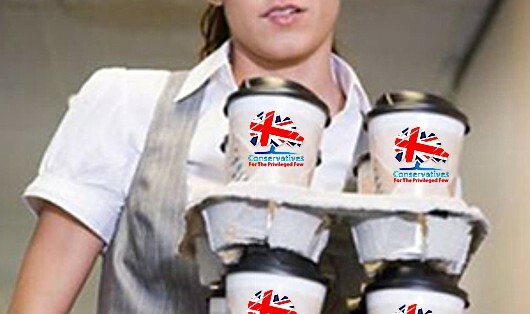 The affair has set off a public outcry, with calls for Miller to resign or be sacked, and for the former Department for Work and Pensions minister to face the same criminal justice system as anyone else accused of wrongly taking taxpayers’ money – like a benefit cheat. … but we need YOUR help to get it. The hypocrisy of the Westminster bubble was on full show today as IPSA, the body which oversees Parliamentary ethics at Westminster, released data showing that between October and November 2013, MPs made over 3,300 claims for expenses totalling £4.5 million. Read more at The Political Ramblings of a Working Class Man. 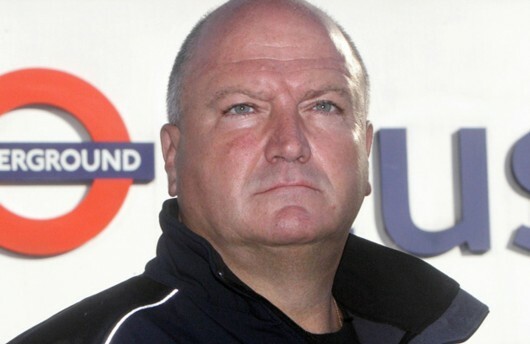 Is anyone else just a little uneasy about the sudden death of RMT Union leader Bob Crow? He died early this morning (Tuesday, March 11), according to the union, at the age of 52. Apparently he had suffered an aneurysm and heart attack, and passed away at Whipps Cross University Hospital. Only yesterday, he had been widely reported as having spoken out in support of the controversial plan for an 11 per cent pay rise for MPs. He said they should be “paid adequately” so they could have “decent accommodation”, and to ensure that those who are not independently wealth are not deterred from public service, according to the BBC. 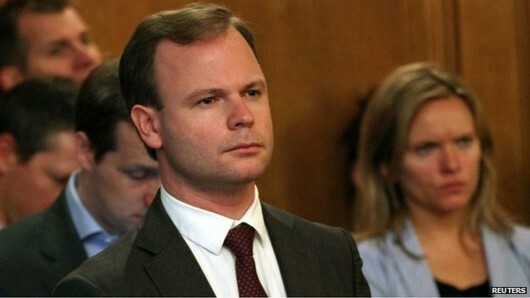 Mr Crow was rumoured to earn £145,000 himself, against which the MP pay rise to £74,000 seems meagre. He has been criticised by the Conservative Party for continuing to live in council accommodation instead of buying his own house and, taken in this context, his words yesterday take on extra meaning. Was he commenting on the way MPs who have been exposed after committing financial irregularites have continually excused themselves by saying they needed the money? Our Parliamentary representatives have been in the news almost constantly since 2009, accused of expenses fraud, or discrepancies to do with their second homes. Even part-time Chancellor George Osborne had a flutter – using taxpayers’ money to make £1 million on a house and land in his constituency, that he claimed he was using for professional purposes (this claim has never been substantiated). He was definitely saying that people with pupblic service responsibilities need the wherewithal to carry out those duties without exposing themselves to financial hardship – and it would be hard for MPs to criticise his own living arrangements after he had spoken up for theirs. Also, it is entirely possible that he was looking ahead to a post-2015 Parliament with far fewer Conservative MPs. In this context, it would be a (rare) unselfish act for the current ruling parties in Parliament to approve a pay rise for their opponents! Now he is dead, and perhaps there is nothing suspicious about it.